Railpictures.ca - Matt Watson Photo: Northwood Pulp 104 is seen switching the large mill just north of Prince George BC. | Railpictures.ca – Canadian Railway Photography – photographie ferroviaire Canadienne. 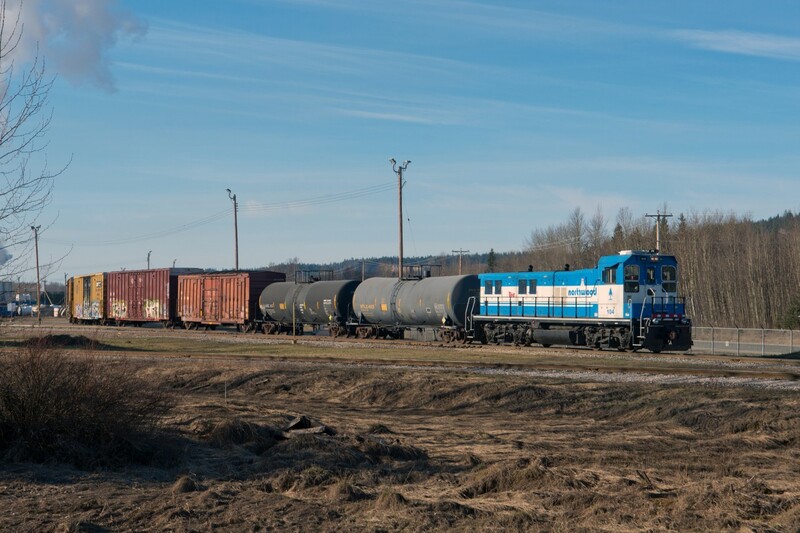 Caption: Northwood Pulp 104 is seen switching the large mill just north of Prince George BC. hoggerdoug – That could very well be correct, the trackside guide calls it Fraser Flats but it has been wrong before. Marcus Stevens – I think what Arnold is saying is that he wants me to post more photos of SD75s and Dash9s instead. on BC Rail we called that area Fraserview. a few miles north of Bridge yard. The mill is or was Northwood Pulp & Paper. Arnold, these days active gensets are almost as rare as Alco’s. awmooney – Yah I’d say 4000kms is a bit far to go to shoot a genset over a fence.